The best cities have at least one large, busy recreation space close to the downtown core. For Nanaimo, it's a long seawall and park/plaza system that is always expanding in length. 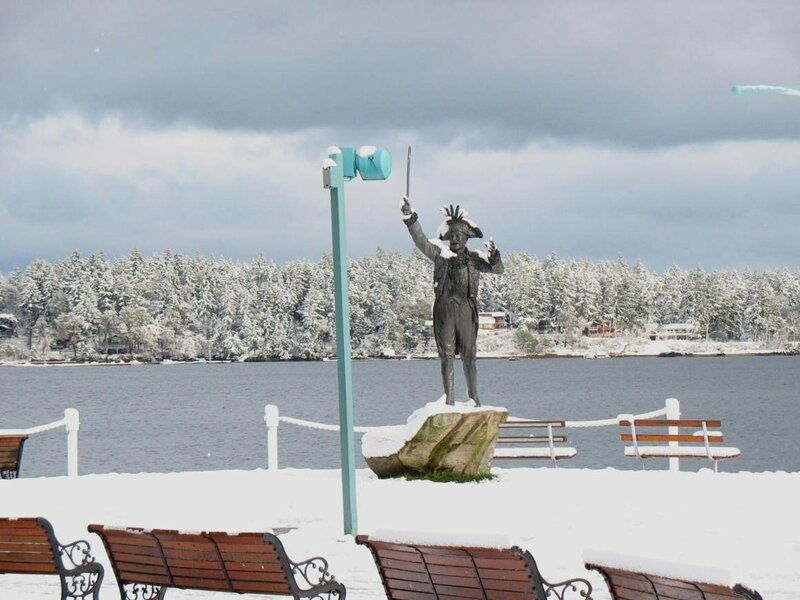 Pedestrians, cyclists and skaters love Nanaimo's waterfront on a warm day. Or even on a blustery, electric kind of day. The world seems clean and copacetic as I walk here with my friends and family - I always enjoy seeing people from other parts of the world - I always wonder if they like what they see (I think they do). The park system's southern border is currently at Cameron Island near Port Place Mall. But much of the property south of that point is being redeveloped for public use and will certainly extend the harbourfront recreation amenities sometime in the future. The park/path stretches north from Port Place past the marina and shops and pub, through Maffeo Sutton Park past Swy-a-Lana Lagoon, all the way to the BC Ferries at Departure Bay. The route becomes patchy and industrial as it gets farther from downtown. Sometime in the future, it is likely that the seawall will reach to Departure Bay Beach. If that happens, nobody will ever want to live anywhere else. 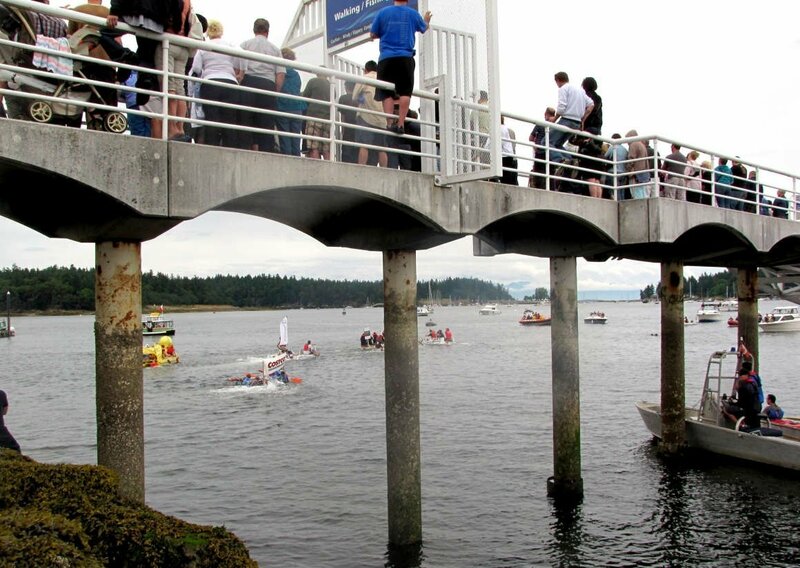 The public "crab dock" goes some way out into the harbour. You'll meet people throwing their crab traps and casting fishing lines. A seal will often come by, to see if anyone will toss it a herring. The focus of Maffeo Sutton Park is Swy-a-Lana Lagoon, a manmade "lake" that's connected to the ocean only at the highest tides. Walkways surround the lagoon, with fountains like tidal pools that spill back down into the lagoon. People swim here sometimes ... the water is warmer than the ocean and there is a small sandy beach. There's a large playground for kids, and lots of spaces for picnics - such as comfortable grassy hills shaded by trees. The "boat basin" under the Bastion is a scenic marina with shops and floatplanes and a waterfront restaurant/pub. Ferries leave for Gabriola, Newcastle, and Protection Islands from this area. The Queen Elizabeth Promenade is a 500m-long multi-lane walkway with lanes for skates and bikes, just above the rocky shore. In front of the Pacifica highrise development and seaplane terminal, there are great views of the harbour and islands, with interpretive signs illustrating bits of local maritime history. The walkway circles Cameron Island (which hasn't been an island in over 125 years), bringing you out closer to Gallows Point and the open ocean, where you can watch the larger boats. Near the Yacht Club, there are lots of great benches with gorgeous views of the harbour. 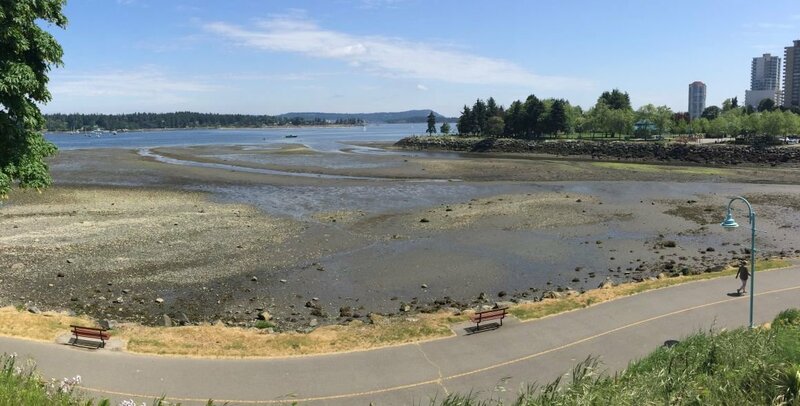 This park is a good starting point for exploring Nanaimo's seawall system. But you can also park near the Nanaimo Yacht Club or in a parkade downtown.